Sometimes an encounter with a book makes me imagine that I would have been a different person had I read it earlier. The Path is exactly this type of book. Written by award-winning Harvard professor Michael Puett and journalist Christine Gross-Loh, the book is a refreshingly relevant and thoughtful interpretation of a wide range of ancient (around 551 B.C. to 217 B.C.) Chinese philosophers, including the well-known masters Confucius and Laozi and the lesser-known Zhuangzi, Xunzi, and Mozi, through historical frames as well as in contemporary applications. I have read most of the original works growing up, some of which I can recite word for word. But, familiarity with the passages does guarantee enlightenment. In a way, they became doctrines from which I would rather keep a distance. However, this book drew me back with its uncovering of the often alienated original meanings of teachings related to how to live a good life. The authors guide the readers into the world of the masters effortlessly, first by constructing the contexts of the births of the ideas and then by defying many stereotypes associated with Chinese philosophy. 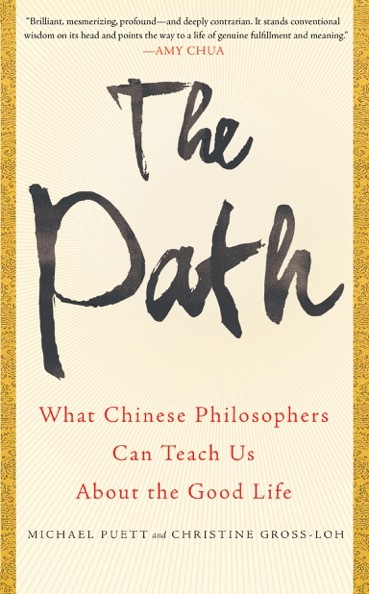 The Path does not romanticize the past, nor does it isolate Chinese philosophers from the rest of the world. Artfully weaving in references to western canon, examples of everyday circumstances, and important historical events, the book establishes links rather than a dichotomy between the west and the east and the traditional and the modern. This approach has made Puett’s class at Harvard, “Classical Chinese Ethical and Political Theory”, the third most popular at the university. At the core of the masters’ wisdom is the potential for improvement as a person, through self-cultivation. Chinese philosophers discuss virtues through real life problems, instead of concocting grandiose abstract questions or extreme case scenarios. This book shows not only the possibility but also the methods of opening up to the environment, regardless of life’s complexity and unpredictability. One of the most radical statements might be that being true to oneself is actually restricting, as the perception of self is bound by a certain time and space. Instead, we as human beings could alter our responses to the streams of sensations and incidents that trigger our emotions in a way that positively construct our relationships. This outlook gives new meaning to rituals, which can shape a person, if one perceives it as a way of interacting with the world. Mundane as it seems, practicing the alignment of heart and mind through routines could lead to influence, growth, subversion, and even transcendence. It is suggested that by changing perspectives, harnessing our input and output, we can turn weakness into strength. We have many choices in life, but does that mean we know how to use our freedom beyond the prescription of the readily available options? Why do we still feel there are so many dead ends in daily life? “Good decisions are made when mind and heart are integrated,” the book says. Many suggestions in the book sounds similar to mindfulness, but the authors point out that compared to Buddhist mindfulness, the practices and philosophies here are to engage with the world rather than staying detached. Puett and Gross-Loh have introduced the ideas in The Path in The Guardian and were interviewed on The Diane Rehm Show (link contains audio and a transcript of the interview as well as an excerpt from the book). Gross-Loh suggested the principles and philosophies are relevant to American parents in The New York Times. The authors will be at China Institute on Tuesday, June 7, 6:30 PM. Beyond Chinatown has been offered six tickets for our readers to the talk. If you’re interested in hearing more about how Chinese philosophy can apply to modern life in-person from the authors, email us at beyondchinatown@gmail.com with whether you are interested in one or two tickets. We’ll randomly select entries to the giveaway and notify the winners Sunday evening.